AFRICANGLOBE – Few who heard the eyewitness accounts of the murder of eighteen-year-old Michael Brown by Ferguson, Missouri police officer Darren Wilson needed an autopsy report to know that Mr. Brown was gunned down in cold blood. The autopsy report and the investigations to follow are the technocracy of racist slaughter, official reports of all of the details except those that matter. Had the murder been an isolated incident it would be tragic. But the death of Michael Brown was a political assassination. The systematic nature in which Black youth are harassed, intimidated, incarcerated and assassinated perpetuates the historic repression of American Blacks from the barbaric founding of the U.S. in slavery and genocide to supposed resolution with the Civil Rights movement. This is to state that any of these murders might be considered individually but the aggregation paints a clear picture of systematic racial repression. The sense of entitlement exhibited when White Ferguson police officer Darren Wilson shot the young Mr. Brown combined the impunity of racial privilege with a pathological indifference toward the person of Mike Brown, his family and his community. Whatever the personal failings of Darren Wilson, it was in his official role on the Ferguson police department that he murdered Mr. Brown. Around the country the appearance of the police as invading armies in poor Black communities is because that is what they are. As the late Huey Newton put it nearly a half century ago, the police aren’t in poor communities to protect property because poor people have no property to protect. And the police in Ferguson conspicuously weren’t there to protect Michael Brown and other youth from violence. 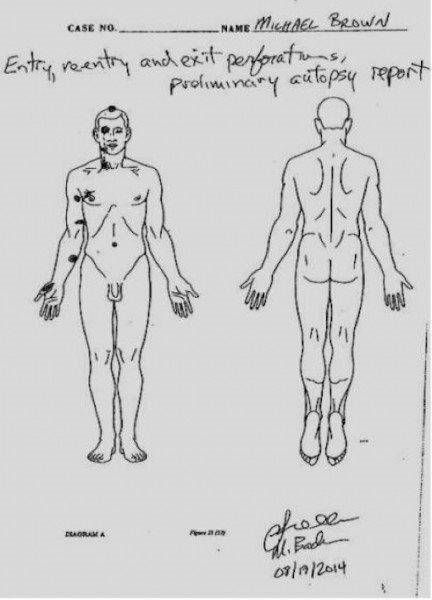 icture (1) above: the (private) autopsy of Michael Brown indicates that he was shot six times, including twice in the head. Given that Mr. Brown was unarmed and that by reports he was fleeing Ferguson police officer Darren Wilson when the shots that ended his life were fired, there was no conceivable threat to Mr. Wilson when he murdered Mike Brown. Public perceptions that there was any plausible rationale for shooting Michael Brown illustrate the role of ‘the law,’ and in particular the role of the police, in strategies of racial repression. To the canard of Black on Black violence, three centuries of racial repression haven’t created a state of justice so why would continued repression by external forces be a plausible way to bring it about? Put differently, why would police violence of any sort be considered a solution to violence? The base premise at work is of intrinsic qualities of social dysfunction that justify / legitimate repressive tactics. The release by the Ferguson police department of a videotape allegedly showing a Black man shoplifting some cigars feeds into this premise. 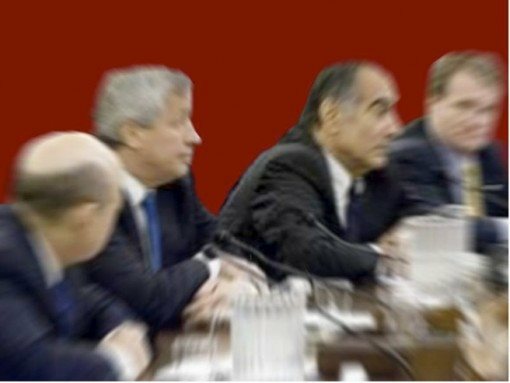 By way of comparison, pictured below are four Wall Street executives who ‘run’ banks that could be accurately described as ongoing criminal enterprises— this by the number of criminal and civil charges made against the banks, not as empty pejorative. Not only would it never occur to any cop in America to empty an entire clip into one of these executives under the premise of intrinsic criminality, the entirety of Western policing is dedicated to protecting them from criminal prosecution and from retribution by those harmed by the criminal acts that they oversee. Picture (2) above: laws as simple as Sarbanes-Oxley legislation could have led to criminal prosecutions of senior Wall Street executives for the acts that led to financial crisis of 2008 – 2009 and the ongoing economic misery they created. The legislation requires that senior executives be held responsible for the criminal behavior of ‘their’ organizations. The impunity, and with it implied immunity from prosecution, of these executives is emblematic of race and class privilege that make a mockery of charges of ‘Black criminality.’ How many poor citizens of Ferguson lost their homes to predatory lending by the banks these executives represent? 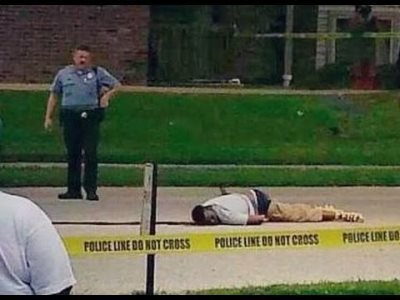 Implied in the release of the videotape is equivalence; that the alleged theft of some cigars changes the balance of culpability in the murder of Michael Brown. Certainly in terms of quantum of accountability senior Bush administration officials launched aggressive war and tortured and murdered and Wall Street executives made off with the economic equivalent of the Atlantic and Pacific oceans filled with cigars. The point here isn’t simply that the Ferguson police ‘miscalculated’ in releasing the video— they calculated exactly and precisely as they always do. The effort was / is racist slander, that even though Darren Wilson didn’t know of the alleged theft of a few cigars he was by degree justified in murdering Mr. Brown because Michael Brown was of a ‘criminal type.’ Conversely, anyone who reads a newspaper knows that senior Wall Street executives committed crimes that they were never prosecuted for. Does the Ferguson police department see a ‘criminal type’ when they see these same Wall Street executives being treated like royalty on television?